Looking for information while you are you performing due diligence on Components Shop Hong Kong from Hong Kong who sells Connectors? If you’re looking for information on this company then read the below experience of one buyer who ended up having problems with this company. You will also find some links to help you find more related information about Components Shop Hong Kong on Supplier Blacklist and on Google as well as other bad suppliers of Connectors reported here on SBL. Pursuant to seller’s proforma invoice, we wired the full purchase price and shipping charges (U.S.$374.17 total) to an account at HSBC Bank, Hong Kong, beneficiary account number 023308117838, beneficiary name: Bolan (HongKong) Trading Co., Ltd. Dave Wang, acting for seller, stated that the order would be shipped within three days of receipt of payment, with a tracking number sent us upon shipment. The wire transfer was paid to that account on March 14, 2018. Since then our multiple requests for information have been ignored. We have received no shipment (promised in 2 or 3 days) and no contact from seller. At this late date (April 4, 2018), we consider the sale a fraud and scam. Always start with a Google search of a new seller. Unfortunately we didn’t search www.Components-Shop.com because we thought we had a legitimate referral to this seller originating with the manufacturer of the connectors. Need More Info on Components Shop Hong Kong? If you need more information, you can click the below links to search for more submissions about Components Shop Hong Kong on Supplier Blacklist as well as go to the search results page on Google for more reviews online about this company. 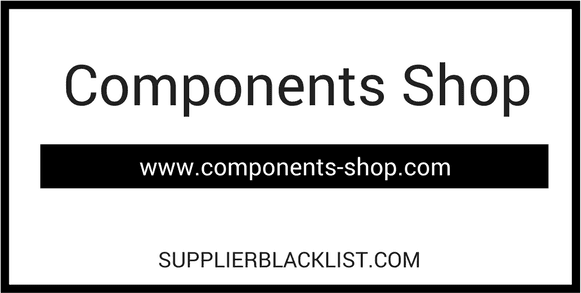 Perform a Supplier Blacklist search for more reviews on Components Shop Hong Kong. Search Google for Components Shop Hong Kong Reviews.